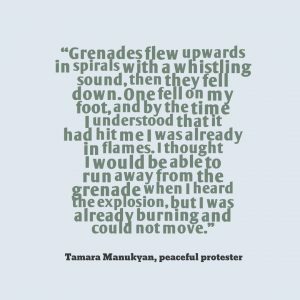 A new report published by International Partnership for Human Rights (IPHR) today provides chilling first-hand accounts of police violence during July 2016 protests in Yerevan, Armenia. The victims of this violence include a 16-year-old boy who lost an eye and dozens of people who sustained broken bones or serious burns. The 32-page report Burnt, Beaten and Betrayed: Armenians Awaiting Accountability for Police Violence is based on the findings of a fact-finding mission and was presented at a well-attended press conference in Yerevan this morning. For the second summer in a row Armenians went onto the streets to demonstrate their discontent at government policies. Almost a year after the violent disbursal of the peaceful so-called Electric Yerevan demonstrations in 2015, the Armenian police again used excessive force to quell predominantly peaceful protests that took place on 17-30 July in Yerevan, the capital of Armenia. To date, the Armenian authorities have failed to bring anyone to justice for the human rights violations in 2015, and in relation to the 2016 events it again appears that the law enforcement bodies are more intent on investigating reports of violence by protesters than those of excessive force and human rights violations committed by police officers. IPHR’s new report describes dozens of cases of beatings of journalists, the detention and severe beating of peaceful protesters, and pressure and harassment by government officials of civic and opposition leaders during the July protests. It also provides a legal analysis of the events and outlines recommendations to the Armenian government on the steps necessary to ensure accountability for human rights violations and restore justice. 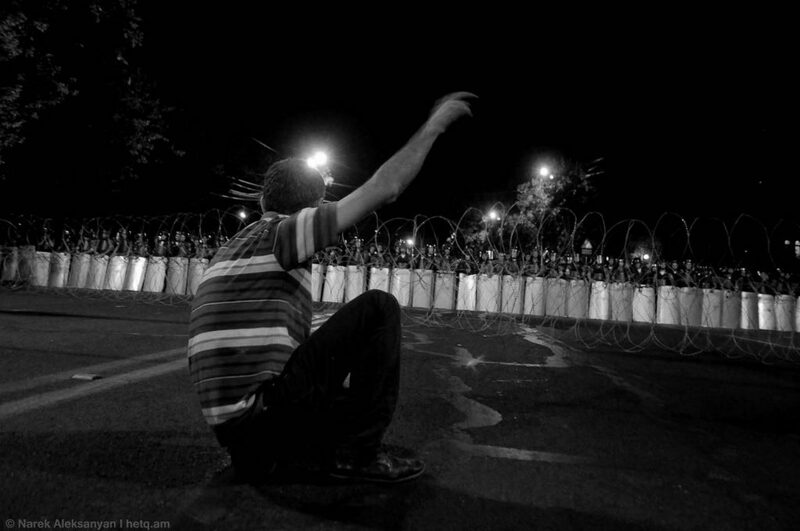 The report highlights the findings of a team of four monitors deployed by IPHR to Yerevan on 28 July to 1 August 2016 to study allegations of the use of disproportionate and excessive force; arbitrary detentions; abusive treatment of demonstrators and journalists and other human rights violations in relation to the protests. The monitors interviewed and recorded testimony from victims, witnesses, lawyers, journalists and NGO leaders who were personally affected by the events. The mission was carried out within the framework of the Civic Solidarity Platform (CSP) and the following three Armenian NGOs: the Helsinki Citizens’ Assembly, the Helsinki Association and Protection of Rights without Borders, as well as the Norwegian Helsinki Committee all contributed to the process of compiling, documenting and analyzing information about the July events. On 17 July 2016 an armed group of representatives of the opposition group “Daredevils of Sassoun” occupied Erebuni District Police Station in southern Yerevan, killing one police officer and calling on the Armenian people to take to the streets to secure the release of imprisoned opposition politicians. As many as 2 000 to 3 000 demonstrators participated in the peaceful protest which ensued, where Armenian citizens demonstrated their support of the group as well as their discontent with the political leadership of the country.